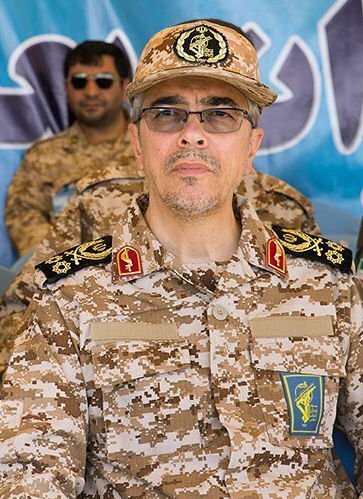 Iranian military chief Mohammad Bagheri. Credit: Tasnim News Agency via Wikimedia Commons. During a visit to Damascus Wednesday for talks with the Syrian military, Iran’s military chief vowed to confront Israel and defend Syria’s regime. Bagheri’s comments came a day after Israeli Prime Minister Benjamin Netanyahu met with Russian Defense Minister Sergei Shoigu in Jerusalem for discussions on Iran and security coordination in Syria. “Iran needs to understand that Israel will not allow this,” Netanyahu told Shoigu regarding the Islamic Republic’s attempt to entrench its military in Syria, near the Israeli border. Netanyahu also raised the issue of the Iranian nuclear agreement, which was recently decertified by the Trump administration, warning Tehran will have an arsenal of nuclear weapons within 8-10 years if the accord is not changed. The Russian defense minister arrived in Israel Monday just hours after the Israeli military launched a strike against a Syrian army anti-aircraft battery, after the battery opened fire on Israeli Air Force planes.